Greetings from Alaska, the Last Frontier. I am a law enforcement ranger and live in a cabin with no television, radio or cable, with one other ranger, with whom I am responsible for an area with size of a small European country. The nearest permanent community is 90 miles away by prop plane; our ranger station is located next to a gravel airstrip that requires the use of a full aviation suit and helmet. I don't date a lot (snark), nor even get to a supermarket very often (double snark). We have no patrol car, because there are no roads, but we do have ATVs and a boat. I am, wait for it, 47 years old. I write to know that there are others are out there, in Alaska, in the Canadian North, in the rest of North America. Hello. I hope all is well ... out there. I'd love to hear from others "nearby," by which I mean anyone north of the 58th parallel or thereabouts. Hello Greg, I hope things are well "down south." That said, I suspect Edmonton is colder in the winter than coastal Alaska (and drier and hotter in the summer). But I'm thinking you must be a far piece west of Edmonton if you're only 30 miles or so from Dawson Creek! I've never been to Edmonton, but I've been to Calgary and Banff and (yes) Lethbridge for an ice rescue class. It was cold there! I actually live 60 miles East of Edmonton but I get around on my bike. A couple of weeks ago we were on Highway 43. It has. Sign that says something about Alaska Highway. I didn't stop to take a picture. But I'll be out there before the end of riding season again. You are right, we are different from Coastal Alaska. We have way more sunshine. The non-existent global warmer is messing with our Winters, we get very few cold days. In the Summer the number of days over 30 C has dropped. In effect we are becoming more temperate. Being on the fire department, we are starting to notice more fire bans. Also the population is exploding. You missed the best parts of Alberta, Jasper, Edmonton and of course the place with the Pysanka. A good friend of mine's daughter took a trip to Alaska and met a man. They are married now. They moved to Hawaii for awhile, hated it and are now in Nome, or nearby. He works in weather, she is a lawyer. Welcome to the site! I think your the first Alaskan we've had in our membership. But as you've seen, you have some neighbors not too far (relatively speaking) from you. We also have members in northern California, including one who also has no cable, no TV and a lot of other "no's"! He'll make himself known soon! It's kind of fascinating that you're so removed from other people in the location that you work. If I can ask, did you initally train as a rookie in some more metroplitan department and then after a while, get plunked down in the area you are assigned to now? Jeez....how do you function being so removed from everyone? It makes me feel gratified to know that we reach into even the most remote regions of the country. It makes me feel that it's all worth it after sometimes feeling that I've been knocking my head against a brick wall all these years trying to make the site available. I hope you become a part of our bunch....mob.... crew....tribe....whatever we are!!! Glad to have you here! Apparently Dawson Creek, BC, claims to be mile 0 on the Alaska Highway and I've never argued with them! I don't want to start an interprovincial rivalry though. I used to work for other agencies which are part of the Department of Justice. But I've never worked for a non-federal agency. It isn't easy being in the middle of nowhere. Park rangers have the highest injury rate of any federal law enforcement agency, 20 times higher than the FBI, 10 times higher than ATF. No surprise really. Except for places like Boston, New York, Philadelphia and San Francisco, cities with significant Park Service presence in urban areas, and maybe a handful of the busiest places in the largest tourst centers of the largest parks, backup is always miles away. Welcome Richard! from almost as far as you can get, (got to give that one to the guys in Key West) away from where you are at, and still be in the continental U.S. I had a guy in my Law Enforcement academy many years ago, that left our agency for a two year stint in Alaska. It was supposed to be a very well paying L.E. job, due to the remoteness. I heard he completed the two years, but he never came back to our agency and I lost track of him. Anyway, I heard similar stories about how remote his area was and that his patrol car was frequently a snowmobile! More power to you guys! Be careful! Hope you enjoy this site as much as many of us do and contribute! You bring a different perspective than probably the majority of us have experienced in our L.E. careers. We have a thread for photos. Somewhere in the threads there is also instructions for posting them to the site. We would love to see what your part of the world looks like! WELCOME RangerRick! I'm the above mentioned "unique" furball in northern California. I'm also the BluePride masterbaker who keeps the cookie jar in the BluePride break room full of yummies. We're delighted to have you with us. I gotta ask... do you prefer to be called Richard or Rick? DO check in often. There is always a lot of LEO mirth and tail-wagging fun. 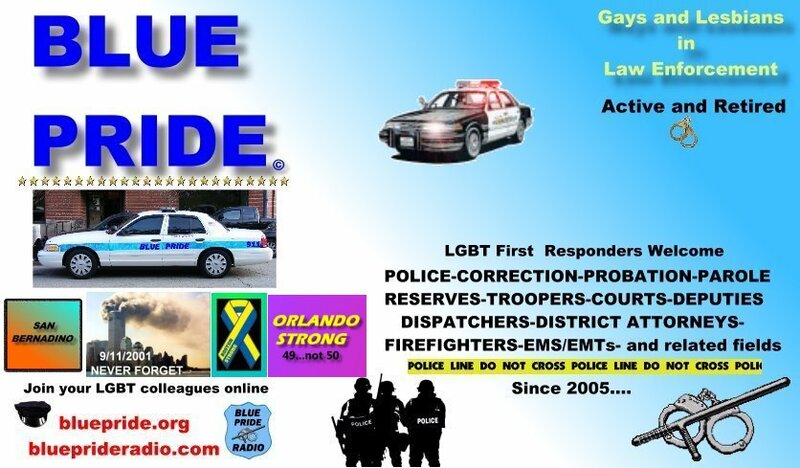 AND, we address very serious topics from LEOs killed in the line of duty, suicide, health issues... many topics that concern our men and women in blue. Pull up a chair, have a cookie (or three) and join in the fun! Thank you Bear. I prefer Richard. Or as I told a rafter on the Alsek, I prefer to be called Thou Bravest Ranger, Protector of Bears! Obviously Alaska is on the North American continent, but it does seem more often than not people mean the Lower 48 when they speak of the "Continental" United States. I've never understood that. Of course that's the other thing. There are really 49 states lower than Alaska, not 48, though I suppose folks are suppose to know which 48 you're talking about. The proper term I suppose is the 48 contiguous states, but no one says that too often. What this does with the District of Columbia, some place I've lived, I'm not really sure, but it would seem to exclude it, creating a hole along the Potomac. There is the related term the "contiguous United States," which arguably does include D.C. though, insofar as the capital city is part of the United States leaving aside any question of its statehood. Much more complicated than one might imagine! One a completely separate note, there's a monument at Point Udall on St. Croix in the Virgin Islands that reads "Easternmost Point in the United States," which I always wondered whether or not was technically correct. I'm not sure it's "incorporated" territory. I believe it's probably more correct to say it's the "Easternmost Territory of the United States," but I wouldn't want to explain that to folks in the Virgin Islands. Thanks, Bear Protector Richard! OH WOW... um, well, uh, being that I am a disabled ol' senior Polar Bear, I'll be GLAD to have my pelt protected by our own BluePride Bravest Ranger Bear Protector! BTW... once the upcoming International Conference (this year in Orlando, Florida) is over, we will be hearing more from our own Black Bear Carroll! Carroll and I are about the same age and similarly HUNKY (read: Gravitationally Gifted... i.e. bearish and FUN.) What a sight we were last year at the Conference in Vegas!... black bear 'n' polar bear (me in my wheelchair with racing stripes and Carroll kindly pushing me around the Luxor doing wheelies! ANYway... this year I am up to my furry ears in schoolwork (I've gone back to school!) and am unable to attend the Conference. BUT, next year our LEGAL International Conference is in Amsterdam West, uh, I mean San Francisco! Please do put it on your list of FUN things to do for next year, Richard! Well I'm glad you appreciate my concern for bears. I have a little .. bear friend who has followed me from place to place, something of a good luck charm, and questions regarding my sanity have been raised as a result! People are foolish and get their knickers in a bunch over nothing. I muddle through. I wish I could be with you all this summer in la Florida. But summer is our busy time. We go to Florida (and the like) in the winter. Keep that in mind the next time you schedule these things! A winter break in warmer climes is quite a good draw for folks I bet.